Blue Polythene Mailing Envelopes in 5 sizes from stock. The Mailing Envelope is metallic blue and has a self adhesive top lid. 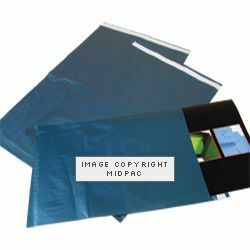 216x350+40mm Pack: 1000 01 Blue Polythene Mailing Envelopes ..
305x406+40mm Pack: 500 02 Blue Polythene Mailing Envelopes ..
330x483+40mm Pack: 500 03 Blue Polythene Mailing Envelopes ..
432x559+40mm Pack: 250 04 Blue Polythene Mailing Envelopes ..
483x737+40mm Pack 250 05 Blue Polythene Mailing Envelopes ..